Why is there a large amount of people failing at fat loss? Concentrating on weight loss is the answer which allows people to give up. Year in and year out I receive emails, messages in regards to fat loss. All starting with, “I have tried everything”. When people say this I know immediately that everything they have tried has set them up for failure and is not the best route to go down. Their long term goals are to reduce the body fat and keep it off. stop eating the things they like, reduce their calories too low resulting in loss of protein ( muscle ) NOT fat. 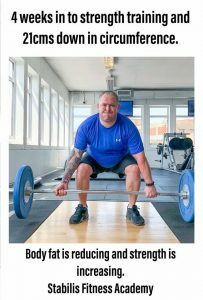 The picture above is Steve, now Steve has been training himself for sometime and all he did was concentrate on the weighing scales. He came to me and we concentrated on the measurements around his body. 4 weeks in 21 cm down. His body fat is reducing and his shape is changing. He even admitted to getting frustrated with the weighing scales but all in good time. The first thing people fail at when trying to lose body fat is they are still consuming to many calories and this is most certainly going to set anyone up for failure. Therefore if your not changing then something has to change. The 2nd is people dieting and not incorporating a strength training program to compliment their fat loss goals. The third thing is people not moving enough to give a larger gap in the caloric deficit. Body weight depends on energy intake and energy expenditure. If energy consumption i.e calories in to the body is larger than energy expenditure, energy out of the body. Excessive energy is stored as fats. This will cause body weight gain, either muscle or fat depending on your goals. If energy expenditure is larger than energy intake, body weight may diminish, again dependent on your goals and training program. If you incorporate a strength training program to compliment your fat management goals then the scales may shift at a slower rate to start with but why? It may seem counter-intuitive, but the scale is better at helping you maintain your weight than it is at helping you lose it. The reason? Changing body composition While your weight is important, what’s even more important is how much muscle you have. Muscle takes up less space than fat, making you look slimmer, and it’s more metabolically more active meaning you will burn more calories whilst at rest. You may not know (or care) about what’s happening inside your cells when you exercise, but what’s going on in there can actually help you lose weight. Exercise teaches your body how to release more fat-burning molecules. The fitter you are, the more fat you burn and that is something the scale can’t measure. If you exercise regularly, you’ll be able to do more and more each time. You may start out exercising for a few minutes at a time or lifting light weights but, after a few workouts, your body adapts, allowing you to lift heavier and go longer. That strength and endurance means you’re making progress, but if the scale isn’t moving, you may not pay attention to how fit you’re getting. Your weight is just one aspect of your progress and, in many cases, it’s not even the most important one. It’s unfortunate but, for most of us, the number on a scale is the determining factor in whether we’ve succeeded or failed. Using your weight as the only measure of your success is a lot like buying a house based solely on square footage. Sure it’s nice to have 3,000 square feet, but what if it’s across from a skunk farm? Your weight loss is the same way. Having your weight at a certain number might be nice, but the scale can’t tell you how fit you are or how much muscle you have. Your scale isn’t going to cheer when you finish all your workouts for the week. Relying only on the scale may even make those workouts feel like a waste of time, even though each one helped you burn calories, get stronger, protect your body from diseases and made you more fit than you were before. Measure your circumference like I do with my clients and like I did with Steve above. 6. It took you a long time to get your body where it is so don’t expect to correct it in such a short time. Have a fabulous day and keep this in mind when embarking on a fat loss program. Never feel alone when it comes to achieving. Next > How serious is the risk to health from obesity?